Calarco, J. A. and Norris, A. D. (2018). Synthetic Genetic Interaction (CRISPR-SGI) Profiling in Caenorhabditis elegans. Bio-protocol 8(5): e2756. DOI: 10.21769/BioProtoc.2756. Norris, A. D., Gracida, X. and Calarco, J. A. (2017). CRISPR-mediated genetic interaction profiling identifies RNA binding proteins controlling metazoan fitness. Elife 6. Genetic interaction screens are a powerful methodology to establish novel roles for genes and elucidate functional connections between genes. Such studies have been performed to great effect in single-cell organisms such as yeast and E. coli (Schuldiner et al., 2005; Butland et al., 2008; Costanzo et al., 2010), but similar large-scale interaction studies using targeted reverse-genetic deletions in multi-cellular organisms have not been feasible. We developed a CRISPR/Cas9-based method for deleting genes in C. elegans and replacing them with a heterologous fluorescent reporter (Norris et al., 2015). Recently we took advantage of that system to perform a large-scale, reverse genetic screen using null alleles in animals for the first time, focusing on RNA binding protein genes (Norris et al., 2017). This type of approach should be similarly applicable to many other gene classes in C. elegans. Here we detail the protocols involved in generating a library of double mutants and performing medium-throughput competitive fitness assays to test for genetic interactions resulting in fitness changes. Large-scale genetic interaction screens using reverse-genetic null alleles have not previously been feasible in animals. RNAi has been used to study genetic interactions in C. elegans by knocking down expression of a large number of different genes in the presence of a single mutant background (Baugh et al., 2005; Lehner et al., 2006). However, this strategy is limited by the variable efficacy of RNAi knockdown, thereby complicating the interpretation of the results. We developed a method for efficient editing of the C. elegans genome (Norris et al., 2015) and recently expanded upon that method to enable large-scale genetic interaction profiling in animals using null alleles for the first time. We focused our initial efforts on neuronally-expressed RNA binding protein genes, which have been shown in a number of cases to act combinatorially (Gracida et al., 2016; Norris et al., 2014). We found widespread genetic interactions among the set of RNA binding proteins we studied, and similar strategies should be broadly applicable to other gene classes as well. Manufacturer: Corning, catalog number: 431762 . The generation of single mutants using CRISPR/Cas9 has been covered elsewhere (Norris et al., 2015). This protocol begins with two single mutant worms in which the genes of interest have been deleted and replaced by compatible heterologous fluorescent reporters. In this example, the reporters are myo-2::GFP (expressed in pharyngeal muscles) and myo-3::GFP (expressed in body wall muscles). Cross ~5 wild-type (N2) male worms (available from CGC) with ~5 hermaphrodites of mutant strain #1 to create male progeny that are heterozygous for the mutation (verify by ensuring the males are fluorescent). Obtain homozygous males of mutant strain #1 according to standard protocols (He, 2011a). Cross males from mutant strain #1 with hermaphrodites from mutant strain #2 (see Figure 1). Figure 1. 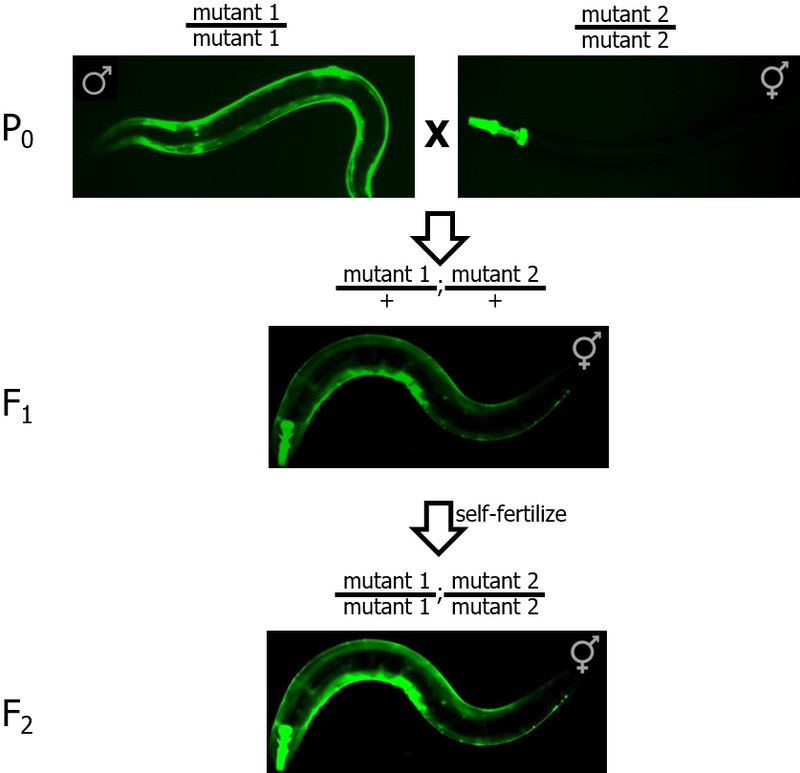 Crossing strategy to create double mutant worms from individual single mutant strains. GFP is used to distinguish homozygous mutants (P0 and F2 panels, brighter fluorescence) from heterozygous mutants (F1 panel, dimmer fluorescence). Pick a single cross-progeny hermaphrodite containing both GFP markers (both myo-2::GFP and myo-3::GFP) onto a new plate. 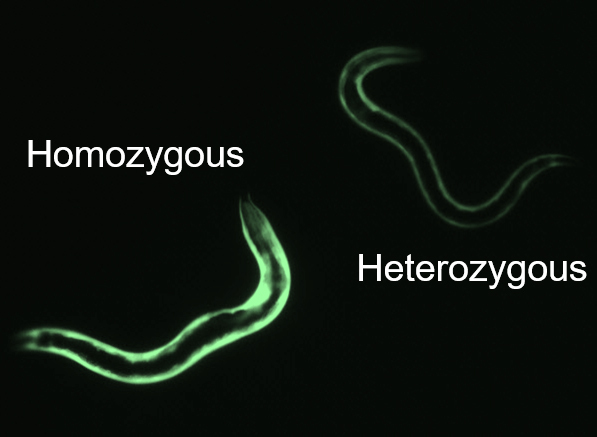 These worms correspond to double heterozygotes (i.e., mutant1/+; mutant2/+). Allow these hermaphrodites to self-fertilize. To obtain double-homozygous strains, pick worms with brighter GFP expression coming from both promoters. On a good-quality fluorescence dissection scope, you should be able to tell a difference in brightness between a strain with one copy (heterozygous mutant) and two copies (homozygous mutant) of the GFP transgene (see Figure 2). Note: Alternatively, pick a larger number of worms to individual plates and determine double homozygotes as worms with progeny that are 100% fluorescent for both transgenes. Figure 2. Fluorescent brightness reveals mutant genotypes. Worms imaged in situ on NGM plates demonstrating that homozygous mutants (left) are noticeably brighter than heterozygous mutants (right). The competitive fitness assay (Figure 3A) provides a simple and relatively high-throughput method for assessing phenotypes of large numbers of mutants and can be performed immediately after strain generation. Pick equal numbers of wild-type (N2) and mutant worms onto one seeded NGM plate (see Recipes). Note: We find that 4 staged L4s of each genotype (i.e., 4 wild-type L4s and 4 mutant L4s) on a 6 cm plate works best to support 2 generations of growth without starving out the plate. Incubate plate at 25 °C for 5 days. Under a fluorescent stereomicroscope count the number of fluorescent (mutant) worms versus non-fluorescent (wild-type) worms. We prefer to count from pre-defined locations on each plate (e.g., 50 worms from the middle of the plate, 50 from the periphery, and 50 from in between). We recommend counting all hatched worms regardless of stage. For ease of counting, worms can be treated with anesthetic or cooled at 4 °C for an hour or longer. Figure 3. The competitive fitness assay. 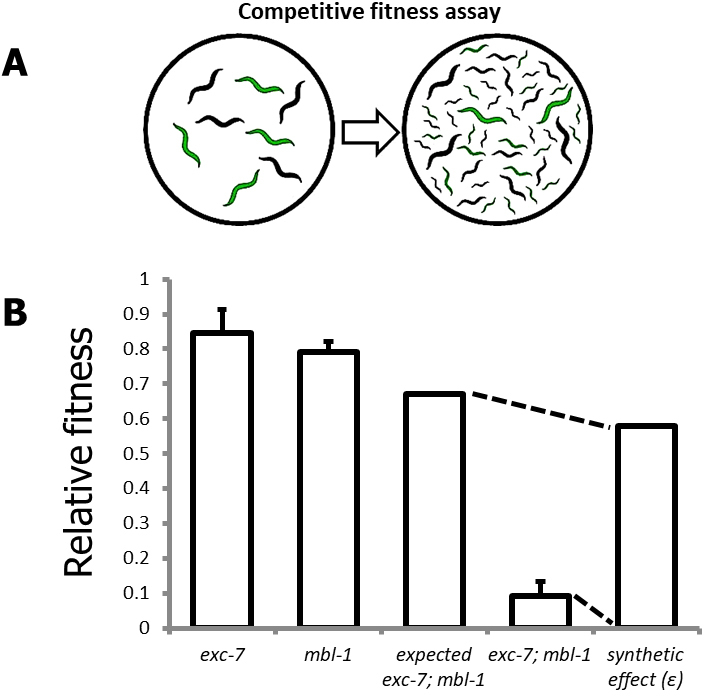 A. Schematic overview of competitive fitness assays; B. Representative visualization of synthetic effect (ɛ) calculation for a genetic interaction between the genes exc-7 and mbl-1. These data analysis steps are an expansion of those detailed in Norris et al. (2017). For robustness, 3 biological replicates should be performed, each on a different day and different plate. This will yield a relative fitness value ranging from 0 (strong loss of fitness) to 2 (strong increase in fitness), with a value of 1 indicating no change of fitness compared to wild-type. This yields the ‘synthetic effect’ score (ɛ). Negative ɛ values indicate a strain with lower fitness than expected, and positive ɛ values indicate a strain with higher fitness than expected. To report statistically significant results, we set a conservative threshold of |ɛ| ≥ 0.20. For strains passing the |ɛ| ≥ 0.20 threshold, a Fisher’s exact test is applied to the aggregate observed values and the null-expectation values with a Bonferroni-corrected P-value of < 0.01 used as the significance threshold. Ensure that worm strains are treated identically for at least 3 days before they are picked onto competition assay plates (e.g., healthy, unstarved, uncrowded plates grown at the same temperature). Note: Recipe from ‘Common Worm Media and Buffers’ (He, 2011b). This protocol was adapted from Norris et al., 2017. Support for AN was supplied by the Floyd B. James Endowed Professorship (Southern Methodist University). Support for JC was supplied by NIH Office of the Director (NIH Early Independence Award DP5OD009153) and Natural Sciences and Engineering Research Council of Canada (Discovery Grant RGPIN-2017-06573). There are no conflicts of interest or competing interest. Baryshnikova, A., Costanzo, M., Kim, Y., Ding, H., Koh, J., Toufighi, K., Youn, J. Y., Ou, J., San Luis, B. J., Bandyopadhyay, S., Hibbs, M., Hess, D., Gingras, A. C., Bader, G. D., Troyanskaya, O. G., Brown, G. W., Andrews, B., Boone, C. and Myers, C. L. (2010). Quantitative analysis of fitness and genetic interactions in yeast on a genome scale. Nat Methods 7(12): 1017-1024. Baugh, L. R., Wen, J. C., Hill, A. A., Slonim, D. K., Brown, E. L. and Hunter, C. P. (2005). Synthetic lethal analysis of Caenorhabditis elegans posterior embryonic patterning genes identifies conserved genetic interactions. Genome Biol 6(5): R45. Butland, G., Babu, M., Diaz-Mejia, J. J., Bohdana, F., Phanse, S., Gold, B., Yang, W., Li, J., Gagarinova, A. G., Pogoutse, O., Mori, H., Wanner, B. L., Lo, H., Wasniewski, J., Christopolous, C., Ali, M., Venn, P., Safavi-Naini, A., Sourour, N., Caron, S., Choi, J. Y., Laigle, L., Nazarians-Armavil, A., Deshpande, A., Joe, S., Datsenko, K. A., Yamamoto, N., Andrews, B. J., Boone, C., Ding, H., Sheikh, B., Moreno-Hagelseib, G., Greenblatt, J. F. and Emili, A. (2008). eSGA: E. coli synthetic genetic array analysis. Nat Methods 5(9): 789-795. Costanzo, M., Baryshnikova, A., Bellay, J., Kim, Y., Spear, E. D., Sevier, C. S., Ding, H., Koh, J. L., Toufighi, K., Mostafavi, S., Prinz, J., St Onge, R. P., VanderSluis, B., Makhnevych, T., Vizeacoumar, F. J., Alizadeh, S., Bahr, S., Brost, R. L., Chen, Y., Cokol, M., Deshpande, R., Li, Z., Lin, Z. Y., Liang, W., Marback, M., Paw, J., San Luis, B. J., Shuteriqi, E., Tong, A. H., van Dyk, N., Wallace, I. M., Whitney, J. A., Weirauch, M. T., Zhong, G., Zhu, H., Houry, W. A., Brudno, M., Ragibizadeh, S., Papp, B., Pal, C., Roth, F. P., Giaever, G., Nislow, C., Troyanskaya, O. G., Bussey, H., Bader, G. D., Gingras, A. C., Morris, Q. D., Kim, P. M., Kaiser, C. A., Myers, C. L., Andrews, B. J. and Boone, C. (2010). The genetic landscape of a cell. Science 327(5964): 425-431. Gracida, X., Norris, A. D. and Calarco, J. A. (2016). Regulation of tissue-specific alternative splicing: C. elegans as a model system. Adv Exp Med Biol 907: 229-261. He, F. (2011a). Making males of C. elegans. Bio-protocol e58. He, F. (2011b). Common worm media and buffers. Bio-protocol e55. Lehner, B., Crombie, C., Tischler, J., Fortunato, A. and Fraser, A. G. (2006). Systematic mapping of genetic interactions in Caenorhabditis elegans identifies common modifiers of diverse signaling pathways. Nat Genet 38(8): 896-903. Mani, R., St Onge, R. P., Hartman, J. L., Giaever, G. and Roth, F. P. (2008). Defining genetic interaction. Proc Natl Acad Sci U S A 105: 3461-3466. Norris, A. D., Gao, S., Norris, M. L., Ray, D., Ramani, A. K., Fraser, A. G., Morris, Q., Hughes, T. R., Zhen, M. and Calarco, J. A. (2014). A pair of RNA-binding proteins controls networks of splicing events contributing to specialization of neural cell types. Mol Cell 54(6): 946-959. Norris, A. D., Kim, H. M., Colaiacovo, M. P. and Calarco, J. A. (2015). Efficient genome editing in Caenorhabditis elegans with a toolkit of dual-marker selection cassettes. Genetics 201(2): 449-458. Schuldiner, M., Collins, S. R., Thompson, N. J., Denic, V., Bhamidipati, A., Punna, T., Ihmels, J., Andrews, B., Boone, C., Greenblatt, J. F., Weissman, J. S. and Krogan, N. J. (2005). Exploration of the function and organization of the yeast early secretory pathway through an epistatic miniarray profile. Cell 123(3): 507-519. Copyright Calarco and Norris. This article is distributed under the terms of the Creative Commons Attribution License (CC BY 4.0).